Studies have shown that diversity gives companies a competitive advantage, drives innovation, and builds a wider customer base which leads to financial gain as seen by DiversityInc’s list of Top 50 Companies for Diversity. To broaden the applicant pool our diversity efforts should emphasize more women in technical and managerial positions, workers of all ages, parents in the workforce, disabled workers and a variety of educational backgrounds to find the workers the tech industry is so desperate for. Underemployment, where full-time work is hard to come by or skilled workers are in unskilled, low-paying jobs, is also a big problem, particularly here in the San Francisco Bay Area. Underemployment occurs when highly competitive job markets meet barriers such as cost of training, access to public transportation or availability of affordable childcare. Local non-profit Techtonica is in the process of launching a tuition-free, full-stack tech bootcamp for women and non-binary adults to address these issues. Techtonica will provide living and childcare stipends, and laptops for students to help overcome common barriers to technical training. 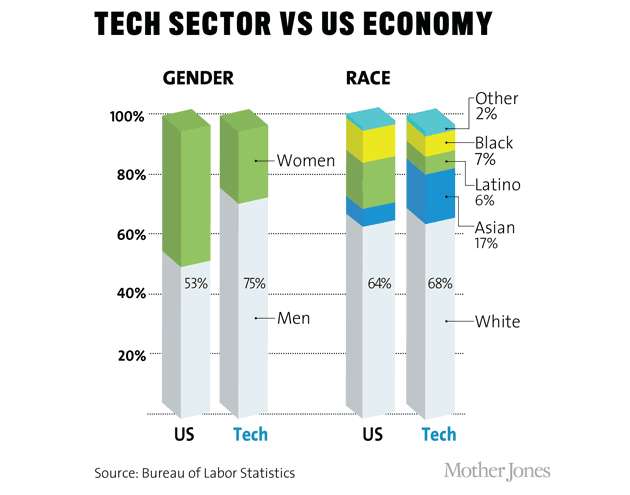 Many initiatives such as Code2040, Women Who Code, Lesbians Who Tech, Black WOMEN Code, TranscodeSF, and Hour of Code have been laser-focused on underrepresented segments of the population gaining technical skills and visibility in the tech industry. These organizations work to train people, connect people and companies, expose more children to computer science and provide safe learning environments for all. Here at Beezwax, my fellow Beez have volunteered for, partnered with and contributed to campaigns for #ILookLikeAnEngineer, Women Who Code, Lesbians Who Tech, TranscodeSF, Hour of Code, Girls, Inc., 42 USA, and this month Beezwax contributed to Techtonica’s #BridgeTheTechGap campaign. Recruiting from community events where Beez can meet a variety of applicants. Creating a standardized recruiting process to ensure fair evaluation of all candidates. Personally engaging with job applicants instead of mechanically processing applications. Valuing an applicant’s time in our vetting process by offering paid interview contracts. Encouraging applicants from non-traditional backgrounds. Listening to feedback from applicants and partner companies to improve our process. Providing a supportive environment where employees can ask for help or question policy. As part of our founder Julian’s vision, Beezwax provides what he calls “custom jobs.” Leveraging the flexibility of a highly-distributed workforce, Beezwax empowers employees to be fulfilled both at work and in their lives beyond. His management style relies on democratic values, transparency, excellent communication and an engaged team. Oh, and by the way, we’re hiring! Check out our jobs page, we’d love to have you on our team. The Business Case for Diversity by Gwen Moran, DiversityInc, 5th edition, August 2006.